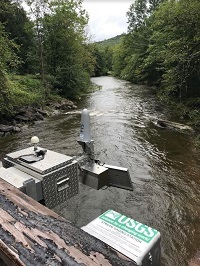 LOCATION.--Lat 41`50'25", long 75`14'18", Wayne County, Hydrologic Unit 02040101, at bridge 1,688 ft upstream from South Branch Equinunk Creek, and 1.72 mi above mouth and Equinunk. GAGE.--Water-stage recorder, non-contact stage sensor, water temperature sensor and crest-stage gage. Datum of gage is 913 ft above North American Vertical Datum of 1988, from GPS survey. Satellite telemetry at station. REMARKS.--Computed discharge below 60 cfs and above 600 cfs are considered poor due to lack of measurement data while ratings are being developed and may change substantially after review.